This month’s brand focus takes a closer look at US blade and multitool makers, Gerber. Gerber were founded in 1939 in Portland, Oregon, on America’s west coast. Here, the frontier spirit called for a range of knives that were capable of roughing it in the wild, and although that’s what Gerber eventually became, it started off as something entirely different. Joe Gerber’s family owned an advertising company, and, as an offshoot of their promotional business, began giving away kitchen knives to potential clients. The knives were of such good quality and so well received, that demand for the knives grew faster than the advertising work. And so Gerber Legendary Blades was born. Now just operating under the Gerber name, the company has grown from strength to strength, and is now one of the most recognisable names in the industry. Gerber have some truly prestigious names working for them at one time or another, including the late great Bob Loveless, one of the most innovative modern knife designers, who designed and popularised many modern knife-making methods. Loveless is famed for saying that he would not pay $3,000 for a knife “if it were autographed by Jesus Christ himself”, and so worked closely with Gerber to create blades that were both effective and affordable. The partnership between the two was a huge success, and, in 1966, the company had to relocate to a much bigger factory to help keep up with demand. The company is now owned by Fiskars of Finland, and supplies a variety of products – not just knives – to suppliers throughout the world. Designed to be small and compact, but still extremely useful, the Zip Hex features five of the most common hex fittings used in all sorts of equipment. Bikes, boards, skis, ATV’s … they all need repairing from time to time; and when they do, the Zip Hex is your best friend. What I really like about this little tool is the quick release clip that allows you to quickly grab the Hex when you need it. And when you don’t, you can just attach it back onto your belt loop or bag, and the tool is so light, you don’t notice it. This is a slightly larger version of the classic Paraframe knife, and the name of the game here is lightness. 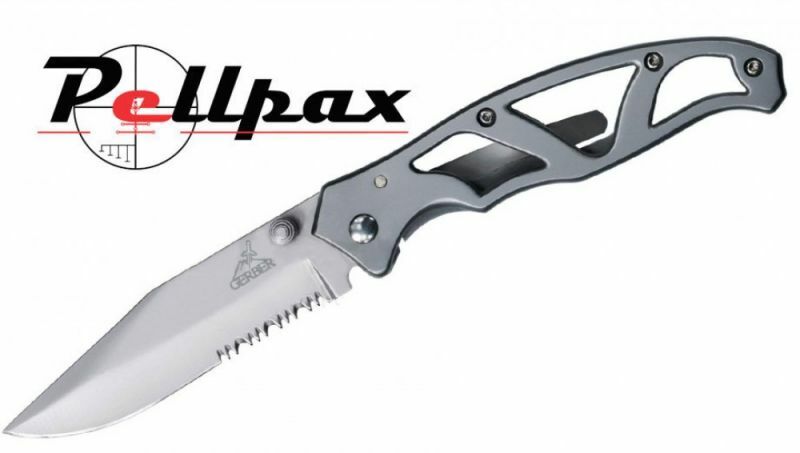 Since the skeleton handle of the Gerber Paraframe II is made from steel, the lightness is not compromising strength. The knife has a little stud on the blade, which is a fantastic little feature, as it means the knife can be opened and shut easily with one hand, even with thick winter gloves on. The knife is available in various sizes, and with either a straight edge or serrated/straight edge combo. I myself prefer the serrated version, because it’s more versatile, and with the larger knife, there’s more blade to fit in. The Gerber Gator Machete is an intimidating piece of kit that’s designed for clearing large swathes of land of any kind of vegetation. The Gator is well balanced in the hands, and features texturing on the handle that’s meant to be reminiscent of an alligator’s scales, hence the name; how much it does, I don’t know, but it does give a good grip in the hands for an assured swing. The back of the blade is a serrated sawtooth, which means there is actually very little that the Gator can’t get through. Comes with a surprisingly nice sheath as well. One of my all-time favourite knives from Gerber, this little knife is just so tough. Again, it has the serrated/straight edge combo and features an incredible full tang construction; most of the knife is just one piece of metal. This makes it strong, rigid, and, most importantly, easily manoeuvrable. The Gerber Fixed Blade DP – SE also has a large cut-out for the fore finger, aiding precision, whilst the yak hide texturing on the handle ensures a secure hold, even in wet conditions. The 3.3-inch blade is titanium nitride coated, which, after some Googling, is an extremely hard ceramic metal that’s over two-and-a-half times harder than steel itself, so you can expect that cutting edge to last. Check out our full range of Gerber Gear here. And to experience more of the brand, head to our Gerber Knives & Multitools collections page.